Last week I received my first order from NYX Cosmetics. I've gone to place an order many a time but the products I've wanted most have always been out of stock. Thankfully the handlers of their Twitter account tweeted me to let me know when they were back, and I bought the following. I first came across this when I was searching the internet for contour products for pale skin. My Sleek Contour Kit is just that little bit too orange for my skin so I opted for this. It's cool toned, so it's great at creating a natural looking shadow under your cheekbones. I think I ordered this after seeing rave reviews on a number of blogs, but when it arrived I wasn't quite convinced that it looked amazing on the waterline. However, it was saved from being tossed to the back of my drawers after seeing an xSparkage video of her using this as an eyeshadow base. It does a really great job and helps colours stand out that little bit more. Another blogger inspired purchase, I ordered this after seeing Jordan's review on the same product in a different shade (Apple Strudel to be precise). I always avoid buying lipglosses as I've never worn one more than once. I generally despise the tacky feel to them, but there was something about Jordan's post that convinced me that I needed one. She couldn't have described them more perfectly - they're thick, non-tacky and melt into the lips. They're not opaque but rather add a sheer, shiny wash of colour to the lips. They're great to layer over a lipstick, and my lips always feel soft after it's faded. These three have given me a really great first impression of the brand, and I wouldn't hesitate to order more shades. 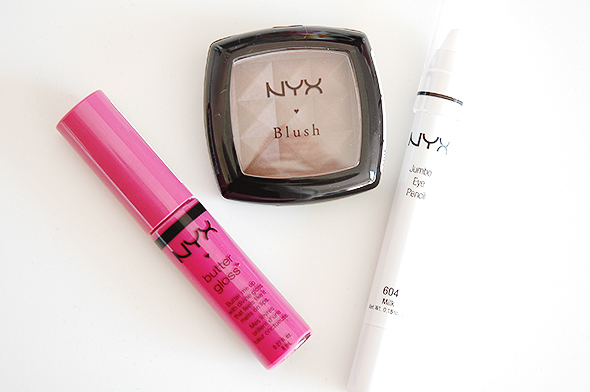 Do you have any favourite products from NYX? The Butter Glosses are absolute favorites of mine from NYX so you've already got my favorite thing from them :) Their blushes are also superb (they've got a huuuuuuge range of pinks and other colors and finishes) and I love their liquid liners. Happy shopping!! All of these items are great! NYX is now carried at some Target stores and I'm always buying their products. Most of them I'm really happy with, especially the butter gloss! 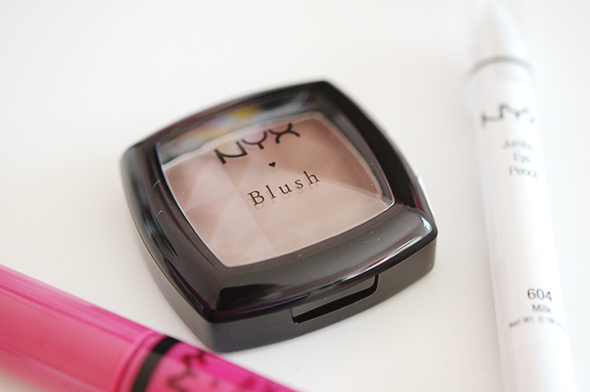 that blush looks so pretty! i've still yet to try NYX because i don't have anywhere near me that carries them. maybe i should place an order online too... i heard a lot of good things about their blush in "raisin," apparently it's a really mauvey pink that looks great for fall and is really flattering on most skintones. Those are great products to try out ! It's given me such a good impression of the brand, their powder blush range is insane! NYX is quite readily available where I live but for some reason, I haven't tried their products yet. I'm quite interested in their powder blushes!